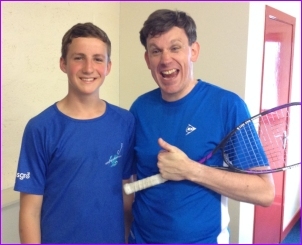 Nairn Sports Club started the 2015/2016 Squash Season with a bang holding a Doubles Tournament at the Club on 16th August. It was very well attended with twelve doubles teams taking part, the vast majority of players coming from the large junior section at the club. Doubles has become a firm favourite after the Commonwealth Games with the young players to the point where they have invented an exceedingly enjoyable and competitive game called 'Two Bounce'. This means that the ball is in play for up to two bounces in a rally, at first glance it would seem to make it easier to play but in reality it means that rallies go on for longer and actually scoring a point becomes more and more difficult. There were two competitions, a traditional One Bounce tournament plus a Two Bounce Tournament. Each one was played in a system of four Divisions of three teams to a Division with the winners of each Division playing in the finals. There was fierce competition with the junior players performing well against their senior opponents. McKay. In the final, Harry Jack and David Massey (a wild card player from Inverness) faced the highly rated Harry Barron and Lewis Barnard from Nairn. There were some long rallies but the teamwork and determination of Jack and Massey meant they defeated their opponents 2-1. The One Bounce saw Fraser Weller and Paul MacDonald take the 3rd Place Playoff with Euan Dawson and his Grandfather Arthur Masson deservedly taking the 2nd Place playoff. The Final was a repeat of the 2 Bounce with Harry Barron and Lewis Barnard again facing Harry Jack and David Massey. This match was a much tighter affair with both teams being equally matched, Barron and Barnard initially benefited from high speed, hard hitting tactics but in the end, again, the teamwork and accurate play, especially on the backhand wall, of Jack and Massey saw them deserving winners. Doubles Squash is not a popular sport in Scotland but Nairn is bucking the trend and the use of the 'Karakal Big Ball' for the Two Bounce version making it a much easier game to learn and take up. The Sports Club has all the required equipment and is keen to help players start the sport, the contact number is 01667 454523. Whitebridge - good vibrations at last?